These savory curry cookies are perfect small treats for Fall and Winter! 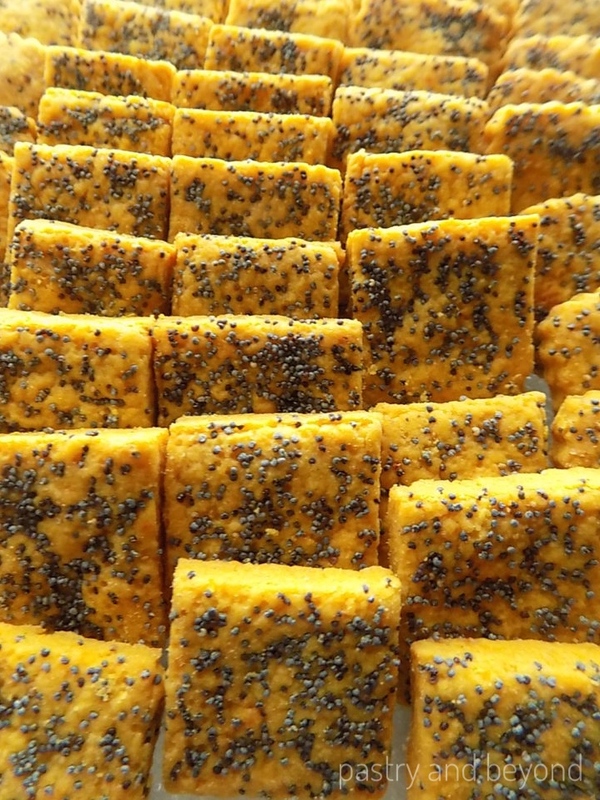 They are melt-in-mouth and poppy seeds add crunch. I made savory cookies with curry and paprika last weekend. My nicely spiced cookies were delicious. So I want to share this cookie recipe with you. 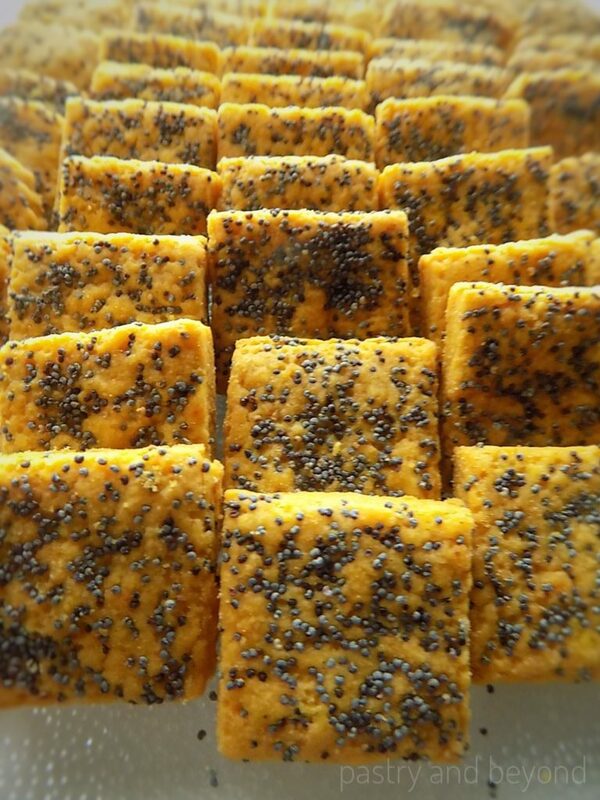 These curry cookies are melt-in-mouth cookies with some crunch coming from the poppy seeds. I use some sugar to balance the spices. 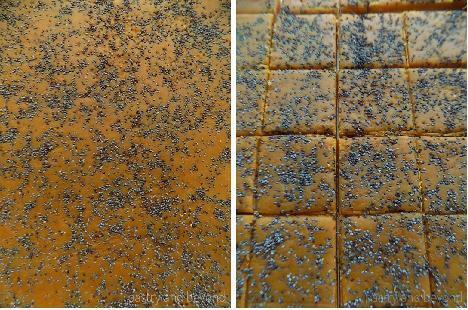 I decorate the top of the cookies with blue poppy seeds which give a nice texture. 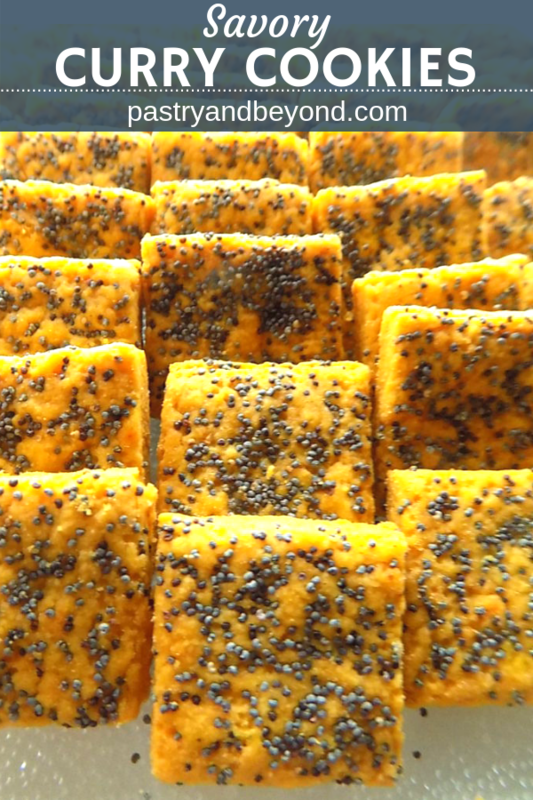 Last week, instead of poppy seeds, I also tried nigella seed but its strong and sharp flavor left curry’s flavor behind. 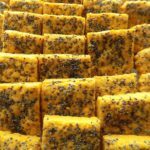 So, I use blue poppy seeds in this recipe. In my first trial, I used too much curry, which left a sharp taste in my mouth. So be careful when using the spices! After this little information, we can go through the stages. First, I mix curry, paprika, salt and sugar in a small bowl and set aside. Next, I put the flour in a big bowl and add in the spice mixture and mix them well. Then, I add the cubed butter to the flour mixture and rub them gently with my fingertips until the mixture looks like breadcrumbs. Finally, I add the egg and mix until the dough comes together. I divide the dough into two pieces and cover each with plastic film, flatten the doughs and let them rest in the fridge for 25 minutes. As I flatten them, they rest easily. I take the doughs from the fridge. Then I dust my work surface with flour so the dough doesn’t stick there. Also, I coat my rolling pin with flour to prevent it from sticking to the dough. 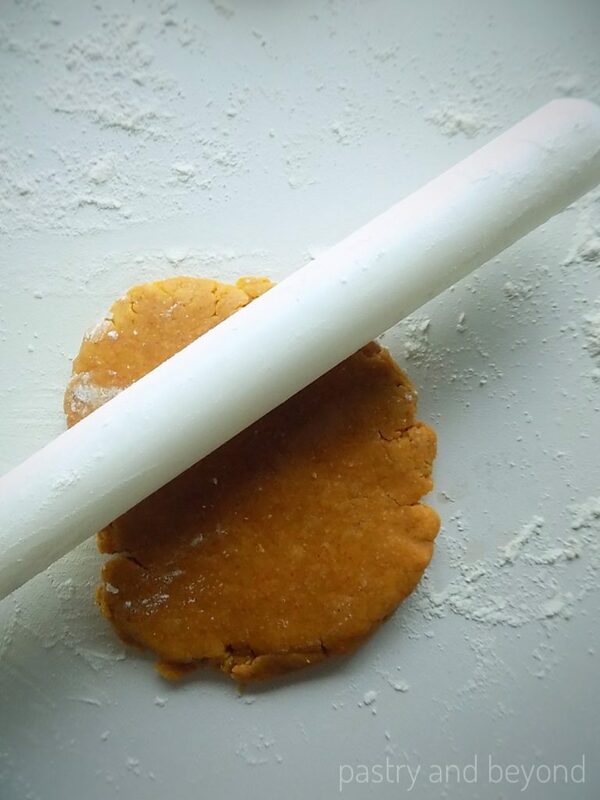 Using my rolling pin, I roll out one of my doughs 9*6 inch (22*15cm) long, 1/5 inch (5mm) thick. Then, I sprinkle half of the poppy seeds over my dough and use my rolling pin to make them stick. I use my 1.2inch(3cm) square cookie cutter. Then I roll out the dough again with the leftovers. Instead of using cookie cutters, you can cut the pieces with a sharp knife too. I use this method for my second dough. I bake them at 350°F(177C°) for 7 minutes until they become firm. Enjoy your delicious spicy cookies! 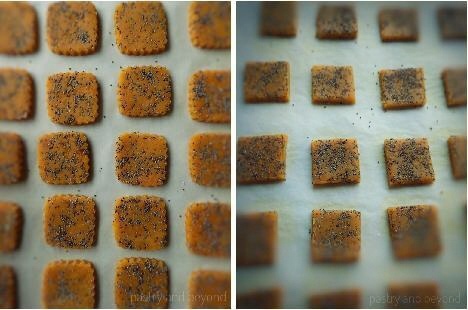 Curry, paprika and poppy seeds make a perfect combination in these melt-in-mouth savory cookies. Put curry, paprika, salt and sugar in a small bowl and mix. Put the flour in a big bowl and add in the spice mixture and mix them well. Add the cubed butter to the flour mixture. 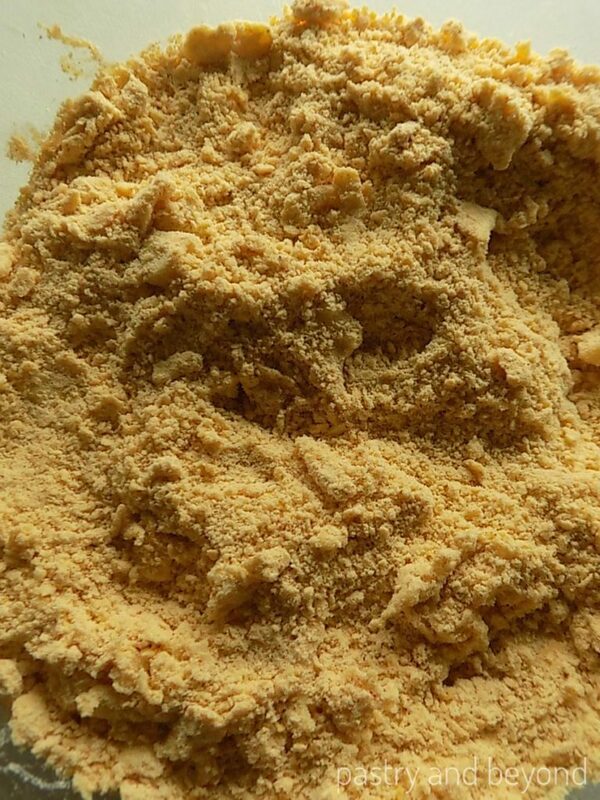 Using your fingertips rub them gently until the mixture looks like breadcrumbs. Add the egg and mix until the dough comes together. Divide the dough in half and cover each with plastic film, flatten the doughs and let them rest in the fridge for 25 minutes. As you divide and flatten the doughs, they rest faster. 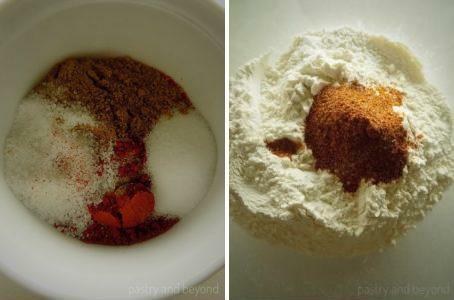 Alternatively, if you want to prepare the dough with a mixer: Put curry, paprika, salt and sugar in a small bowl and mix. Put the flour in a big bowl and add in the spice mixture and mix them well. Place the butter in a large bowl and beat on medium speed for 1 to 2 minutes until it is soft with a hand-held mixer or with paddle attachment if using a stand mixer. Add the egg and mix well. Stop the machine and scrape down the sides of the bowl with a rubber spatula to be sure they are all mixed. Add in the flour mixture and mix well until the dough comes together. Divide the dough in half and cover each with plastic film, flatten the doughs and let them rest in the fridge for 25 minutes. As you divide and flatten the doughs, they rest faster. 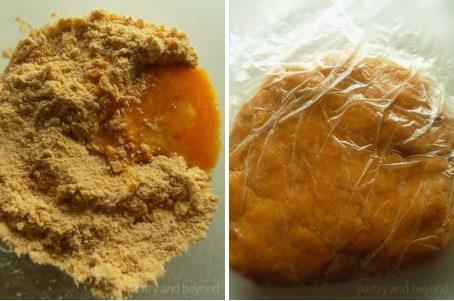 Remove the doughs from the fridge. Preheat the oven to 350°F(177C°). 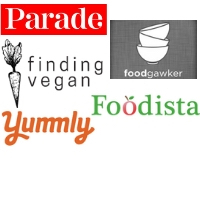 Line baking sheet with parchment paper or silicone baking mat. Set aside. Lightly flour the worksurface and the rolling pin, so the dough won't stick. Roll out the dough 9*6 inch(22*15cm)long, 1/5 inch(5mm)thick. 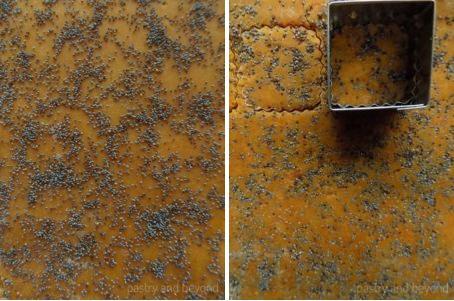 Then sprinkle half of the poppy seeds over the dough and use a rolling pin to make them stick. If you have, you can use your cookie cutter or cut them into 1.2 inch (3cm) square pieces with a sharp knife. Repeat the same steps with the other half of the dough. Bake for 7 minutes until they become firm. Let them cool for 5 minutes on the baking sheet before transferring them to a wire rack to completely cool. **You can take the butter from the fridge 10 minutes before you start working with it. This will make you work easily when rubbing.